There something about Banana Bread. No matter what’s in it – it always seems so healthy. Even though it’s probably more of a cake and therefore a dessert, I never feel guilty eating it for breakfast. 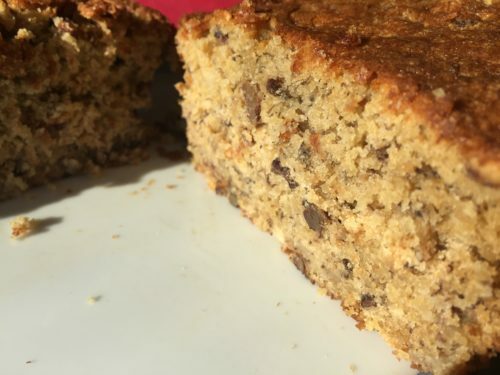 So since today it National Banana Bread Day, we started it off with fried eggs, hash browns and….a big slice of one of our favorite banana bread. Our All Purpose Flour Blend makes it super simple to put together. And you can use our Toasted Oat Flour to make your favorite GF Flour blend too. And if you don’t have any ripe bananas – no problem! 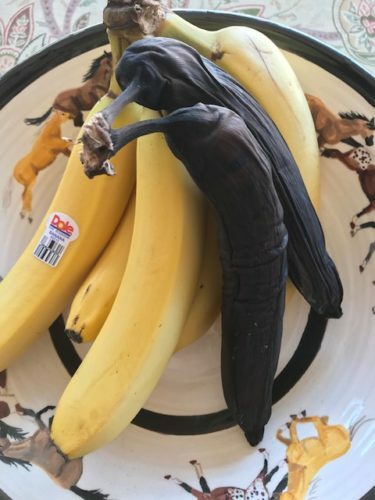 Just put your yellow bananas in a cold oven and heat to 350 degrees. When the oven is up to temp the bananas should be dark brown and soft, looking just like very ripe bananas. Seriously, it works like magic. Please see my re-post of the recipe below. So great to hear. The recipe for the frosting is Jeremy’s. I’ll ask him for it and email it to you. Jeremy said he used a simple meringue recipe from Taste of Home. Basically egg whites and sugar. I’m sure you can find it. Please let me know how it turns out.